We’d love your help. 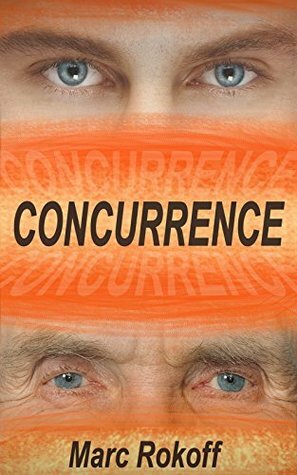 Let us know what’s wrong with this preview of Concurrence by Marc Rokoff. Phillip has dedicated his life to achieving cross-time communication through the NOLTEX assembler. He only breaks away from his work once daily to visit Justin, his comatose boyfriend, in the local hospital. When a sudden breakthrough allows Phillip to talk with himself three months in the future, there’s plenty of reason to celebrate the success. He has single-handedly in Phillip has dedicated his life to achieving cross-time communication through the NOLTEX assembler. He only breaks away from his work once daily to visit Justin, his comatose boyfriend, in the local hospital. When a sudden breakthrough allows Phillip to talk with himself three months in the future, there’s plenty of reason to celebrate the success. He has single-handedly invented one of humanity’s greatest scientific achievements. To ask other readers questions about Concurrence, please sign up. First time novelist, Marc Rokoff didn’t let himself off easily. Instead he took a very heady subject and saw it through. I can’t fault him for plotting or arc, but to have made this really work I needed to like the main character more. To some, his awkwardness came across as endearing but his quick temper, obsessive nature and little tolerance for mediocrity was a barrier that pushed many away – even those he loved most. Phillip – Scientist, introverted, gay and on the brink of mankind’s biggest discovery. Future, Past and Far Future Phillip – Still unlikable. Phillip has isolated himself in his home laboratory working on a scientific breakthrough that the rest of the scientific community has ostracized him for. He has huge motivations for wanting desperately to see his invention work; his boyfriend is comatose but just maybe there is a chance at righting some wrongs. His NOLTEX Assembler allows Phillip to speak to himself in the future. While this is an epic discovery for Phillip I was somewhat unimpressed by the impact of the event. After just a moment of speaking with his future self he basically says – cool, I’ll call you back in a month. I mean, for me, I wouldn’t ever cut off that connection. While the science is intriguing, again, the human aspect just didn’t make sense to me. Mr. Rokoff has talent. I believe with some more experience he will be able to engage the reader more fully and drive his work to reach a wider audience. The sci-fi aspect of this book is solid and intriguing, even thought-provoking, but it’s the human factor that is missing. And in fiction, particularly fiction with a romantic bent, that human factor is going to make or break the read.